Listening and evaluating clues from verbal directions is a skill that helps preschool-aged children gain meaning from the content of a book or story. Giving them opportunities to practice this skill will help them comprehend what they read or see. Making up riddles for your child is a great way to exercise his mind to develop this skill. Make up riddles for your child to solve in the car, in the tub, or around the house. They can, at first, be related to your location so your child can pick up on visual cues, but as your child gets better at solving them, they can be more obscure. For example, if you’re in the bathroom, you could say, “You squeeze me. I clean your hair” (shampoo). Or “I am shaped like a pencil. I help you clean your teeth” (toothbrush). Getting your child to think about the characteristics of an object helps him think about what makes things unique. This activity will help with comprehension, listening, memory, attention span, and following directions. Once your child gets the hang of it, have him make up riddles for you! 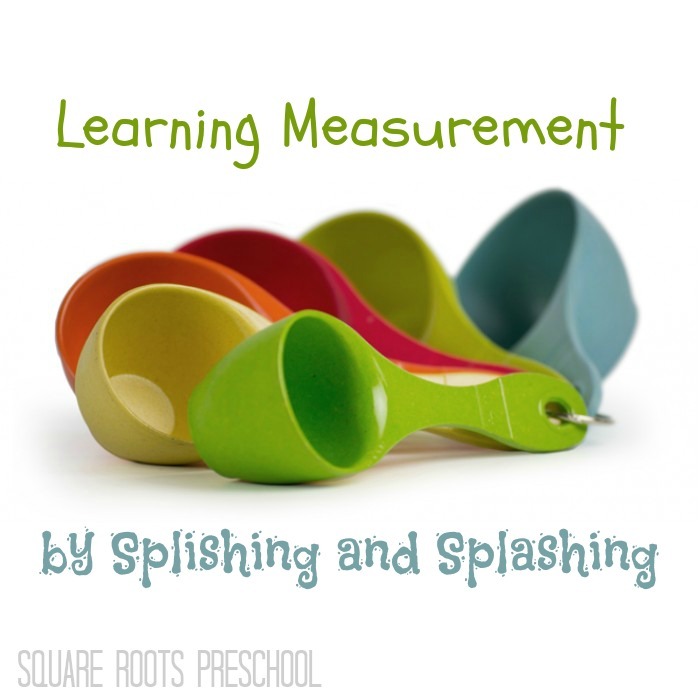 The teacher/student ratio for Arizona is 1:13, but Square Roots Preschool has a ratio of 1:4. We believe that smaller class sizes benefit preschool aged children for a variety of reasons. • Our teacher truly gets to know each student well–their strengths and weaknesses–and has the time to spend one-on-one time with each student, helping to foster strengths and personal interests and provide help in areas that may need improvement. • The students get to know one another well and develop deeper, more supportive relationships than they would in a larger class. • Our projects and lessons are more detailed and in-depth, as we have time to help each student through the process. • We get to know our families well and have time for more communication regarding individual students. • Each student gets more “turns,” or opportunities to speak, practice, share, and actively participate rather than sit back and watch others. We believe in hands-on learning. • Students have greater involvement, and no one is in the background. This is especially beneficial for shy children. • Each year, we can tailor the classroom activities to the individual students in the classroom. If everyone loves trains, we’ll incorporate that into the class, for example. Everyone becomes more engaged. • Students new to preschool feel comfortable and secure coming in and older children setting off for kindergarten feel confident and well-prepared. Could your child benefit from a small, home-based preschool? Please check us out, and please spread the word. We’re currently enrolling for fall 2014 and would love to meet you and your child! Come Visit Us! See what we’re all about! Establishing strong roots is important for the future. 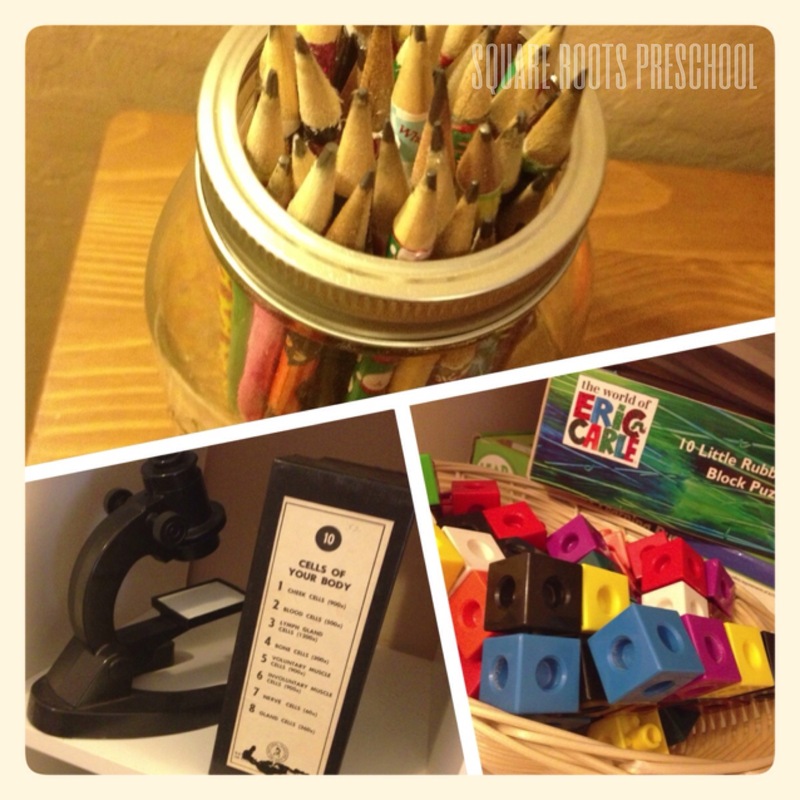 Square Roots Preschool exists to provide a safe, developmentally-appropriate environment for preschool. Our focus is to provide a secure and stimulating early education experience that promotes each child’s social, emotional, physical and cognitive development. Our goal is to help grow a desire in children to be life-long learners. 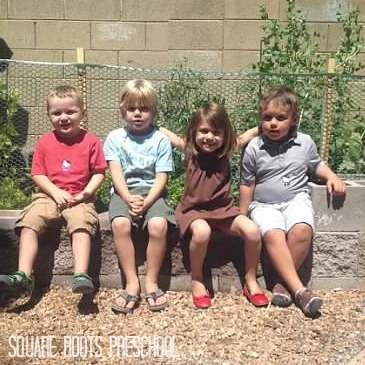 Square Roots is a home-based Gilbert-area preschool uniquely designed to be your child’s secure transition into kindergarten. We partner with parents to establish roots for a successful path of life-long learning. Our goal is to have a classroom that encourages imagination and builds confidence. Our creative curriculum is play-based. We educate our students about their place and responsibility in their community. We teach wellness and maintain an environmentally-friendly, chemical-free classroom. At Square Roots, your child will be in an environment that emphasized interpersonal skills, environmental awareness, and a sense of community. Classroom materials serve needs from helping children to develop their sensory and motor skills to problem solving and teamwork, all of which help build pre-kindergarten skills. We currently offer two scheduling options for our two-day, class-only program and are taking names for an interest list for an afternoon class. We work with our families on an individual basis, so please let us know your needs. We would love to give you a classroom tour! 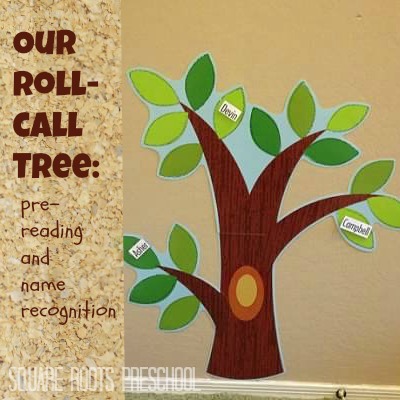 Please call 480.447.ROOT or email taryn.squarerootspreschool@gmail.com for more information.